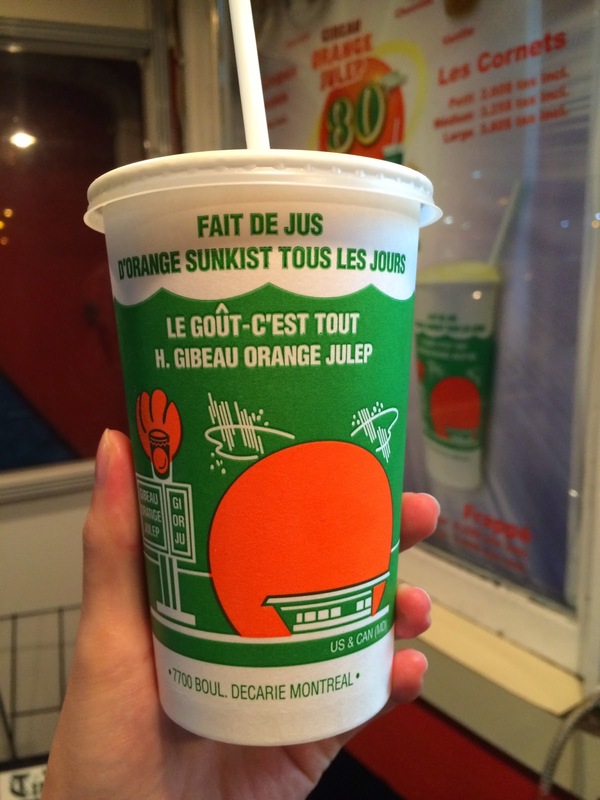 This is another poutine place we went to after St-Hubert called "Gibeau Orange Julep" in Montreal. It's a fast food restaurant shaped of an orange, 3-story high which is about 12m (40 ft.) in diameter. 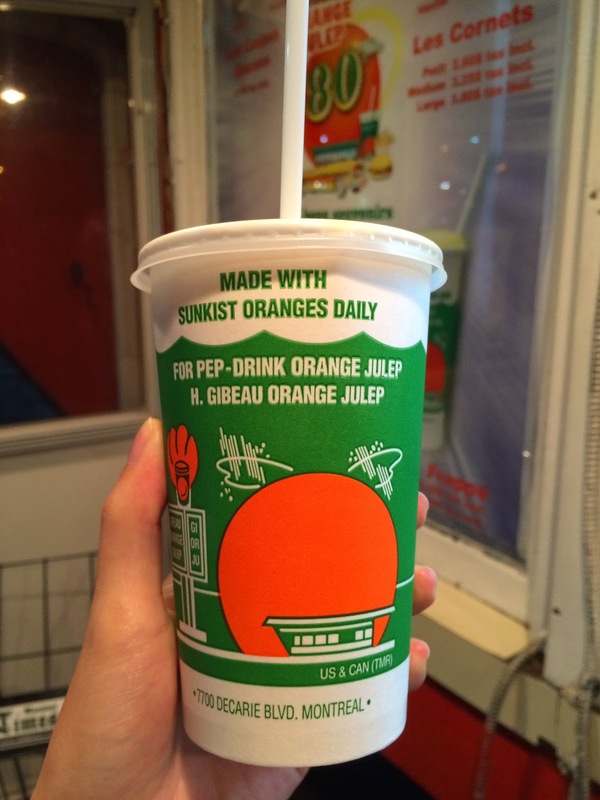 Hermas Gibeau started this restaurant in 1932 to sell his characteristic orange drink "Gibeau Orange Julep." In 1945, he built an orange concrete ball which was 2 stories high, which they say he's going to live inside with his family and run the business. 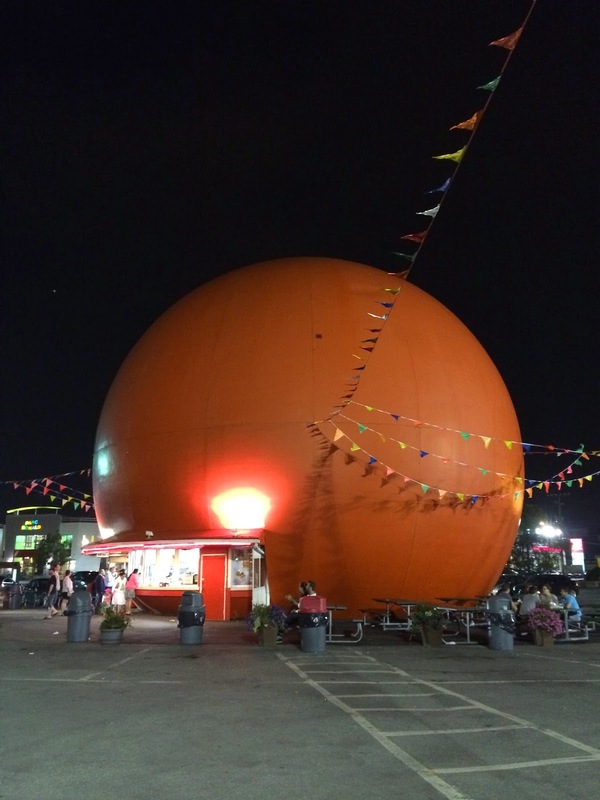 The restaurant and its orange sphere were rebuilt to make it larger and moved further back when the Decarie Expressway was widened in 1966. 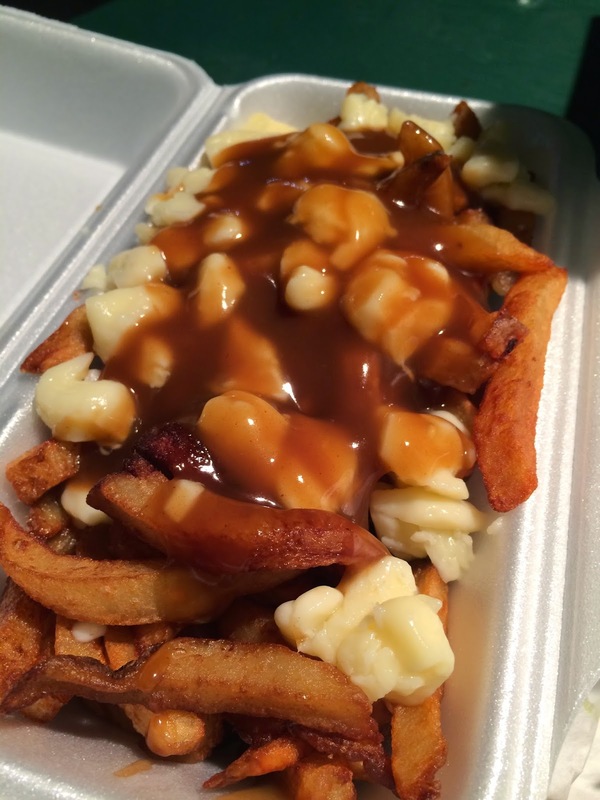 When I research for poutineries, this place usually comes up on the list. 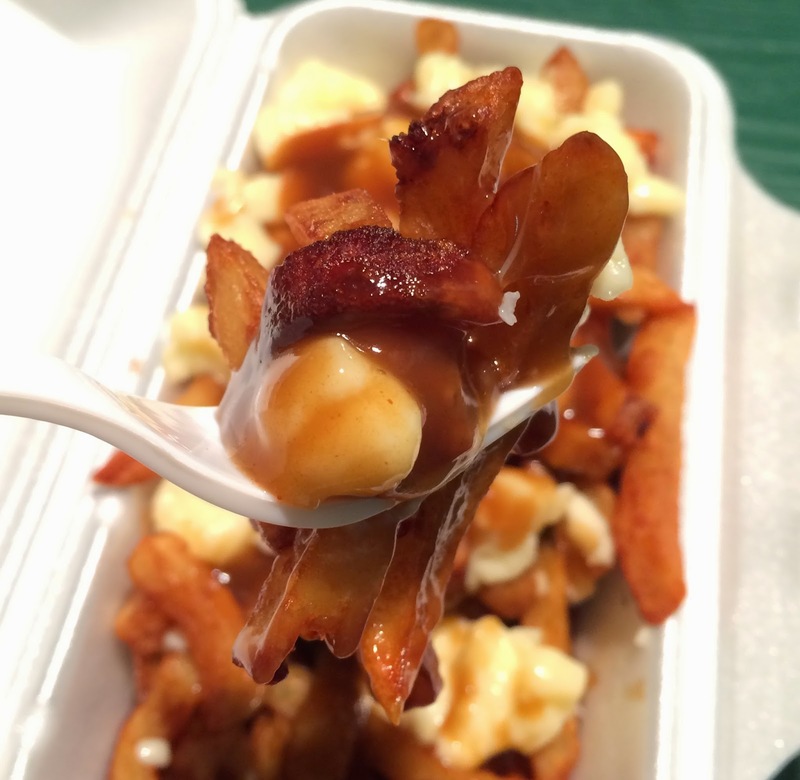 The reviews were contrary; either they really love it or hate it, so we're interested in trying to see if we appreciate their poutine. It's 9 PM or later but there're about 10 people eating around the orange ball. 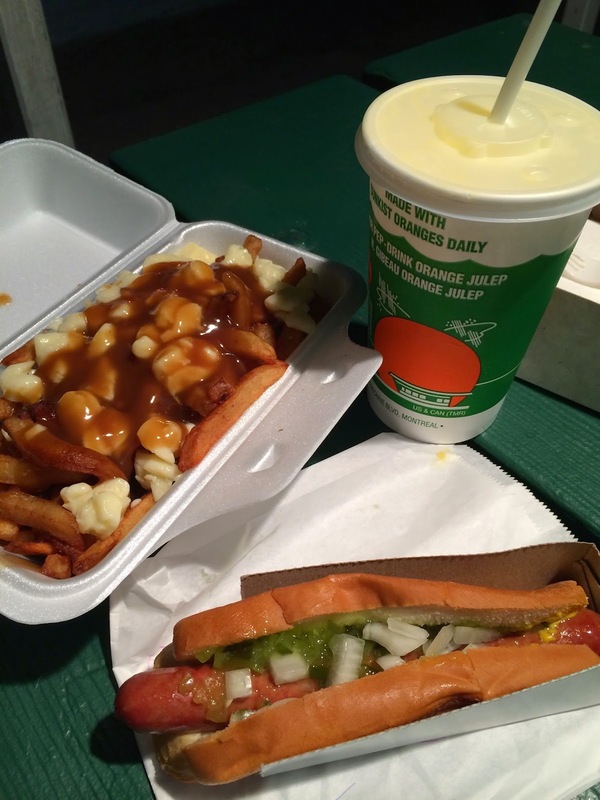 We're gonna get the popular Orange Julep and the poutine, but we saw that they had Nathan's hotdog (100% beef), so we decided to get a set which completes our wish. This is the tank of Gibeau Orange Julep. First they gave us a cup of Orange Julep. 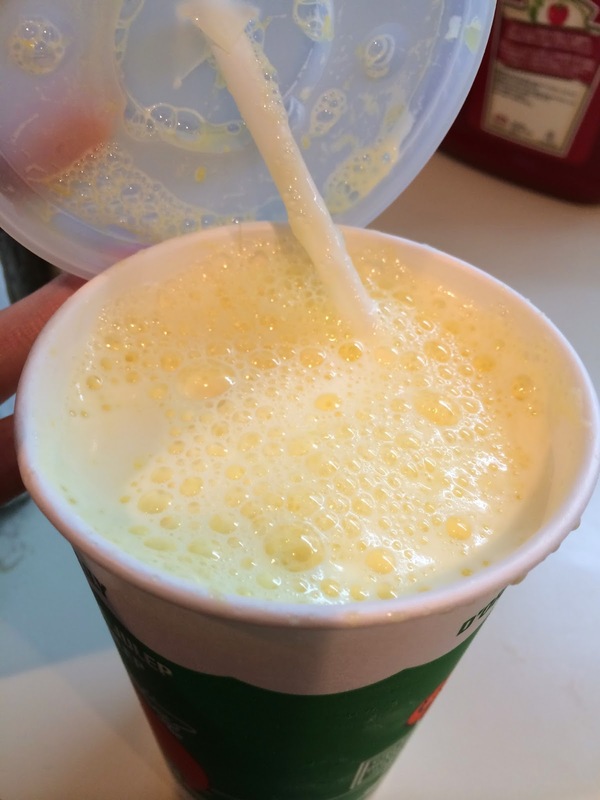 It looked like pale orange milk shake. 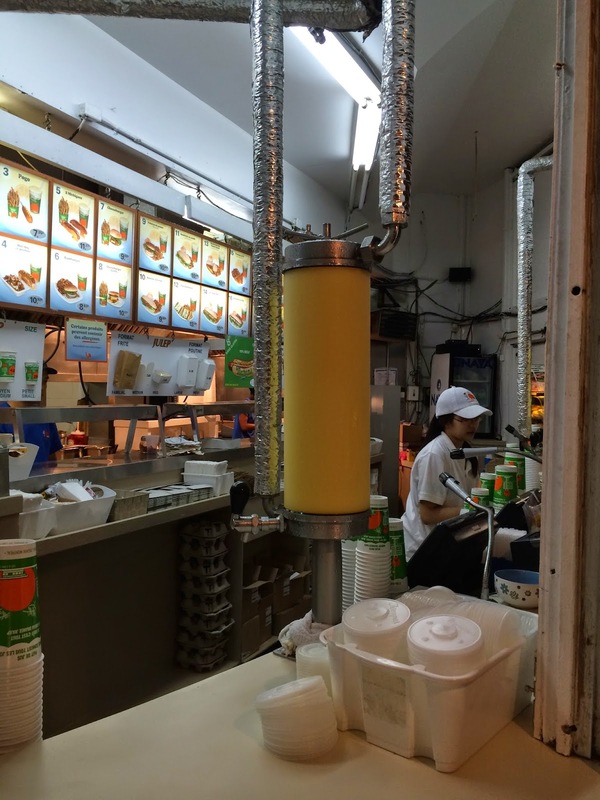 It tasted as if it's a mix of melted orange flavored ice cream with some liquid to dilute. 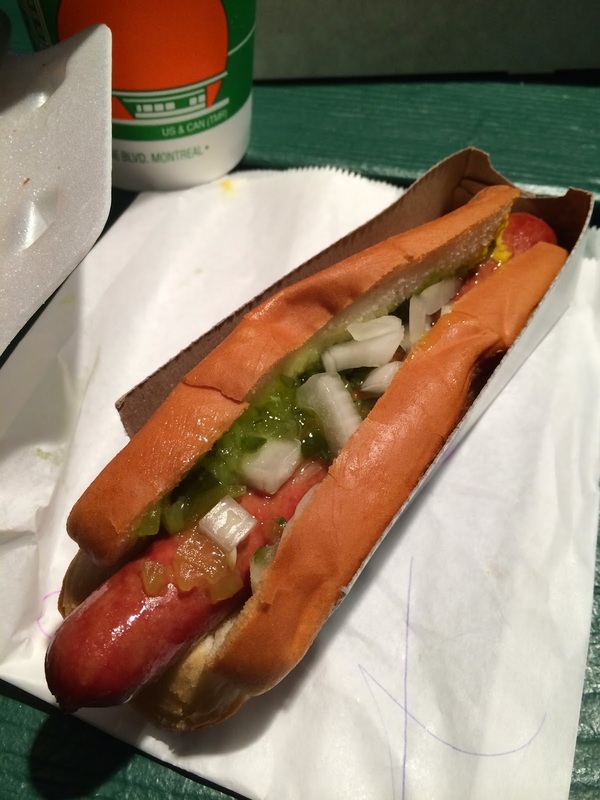 My husband ordered "all-dressed" on the hotdog, and it had relish, onion and mustard but no ketchup, so my husband went to the counter and got some mini cups. 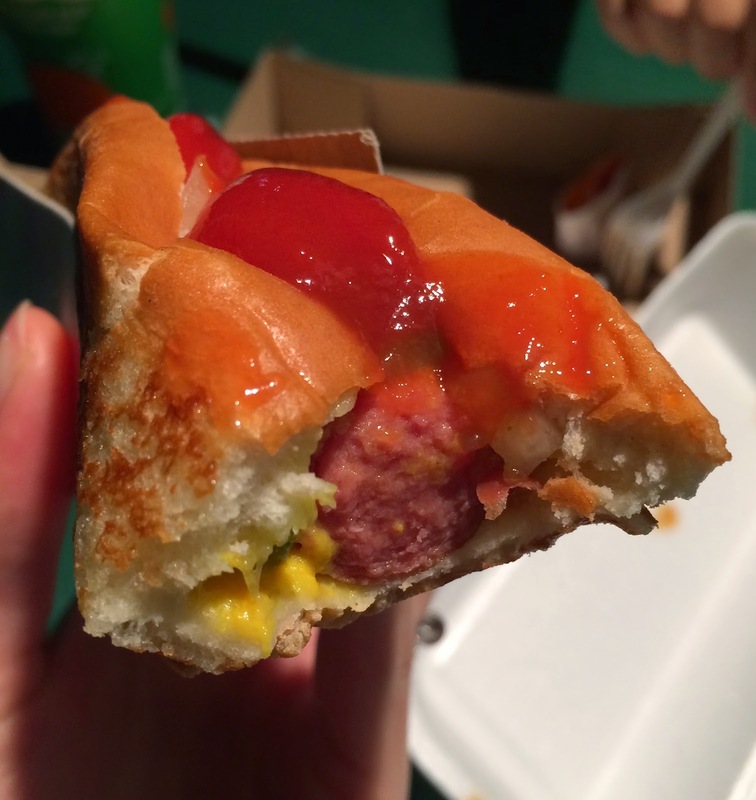 To be honest, it's a Nathan's hotdog so it tasted like a classic hotdog without anything to mention. Thick cut fries were soft and very oily, and only the edges were crispy. I thought they'd been sitting in the fryer too long and they didn't drain the oil well. 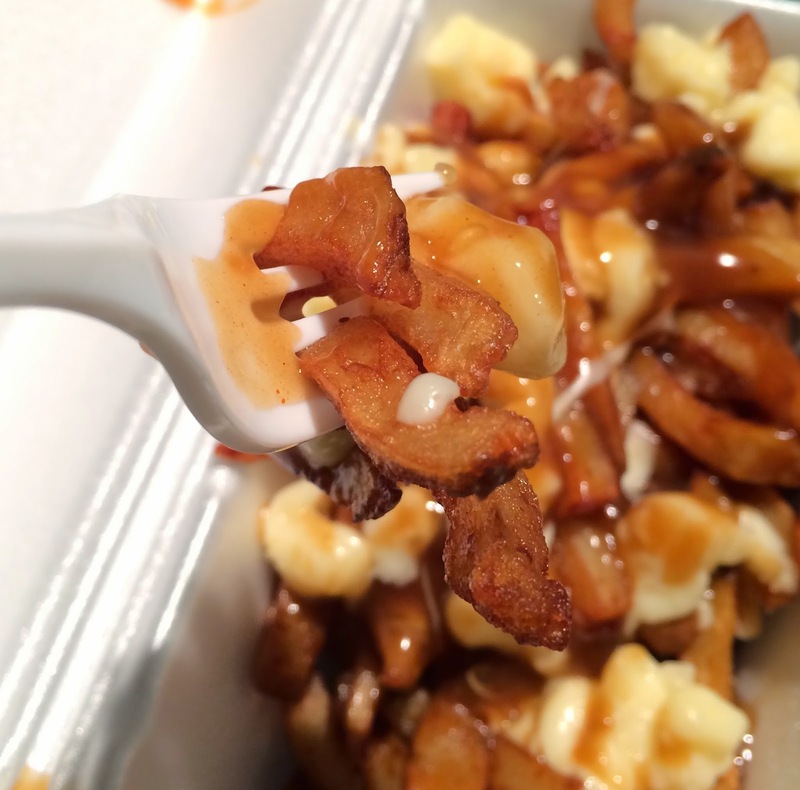 Cheese curds were soft and had no squeakiness. Gravy sauce was salty and had some sweet flavor. Personally I liked St-Hubert more than this. 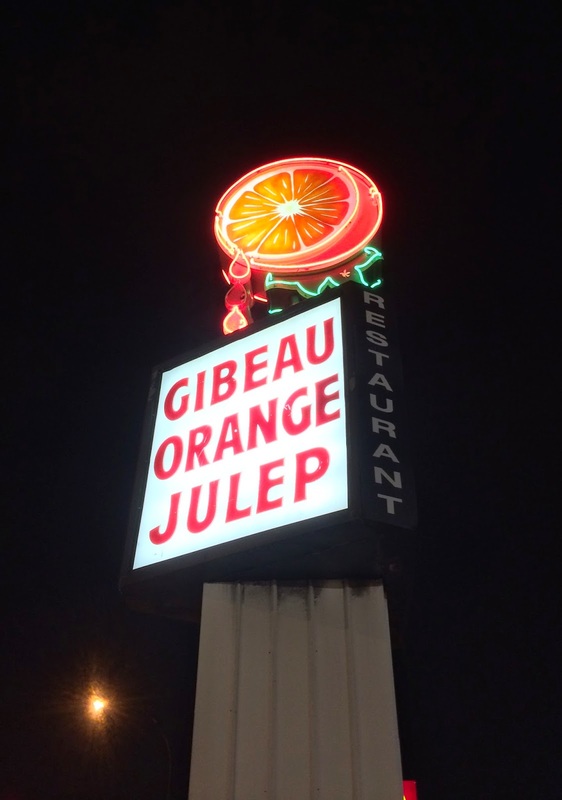 As a unique shaped restaurant serving Gibeau Orange Julep, it's worth visiting but I wouldn't get excited about the poutine, just for the photos of the famous Orange Julep and the orange sphere. Business hour differs by seasons.